Do you have any fur babies living in your house? By “fur babies” I generally mean cats or dogs, although I do know of people who have rats and ferrets! In my household there are three cats – two boys and one girl – and they each have their own peculiarities and personalities. And I reckon they probably think they rule the house! I couldn’t imagine not having fur babies in my house. Ever since I was small I’ve had a pet of some sort, mostly a dog or a cat, but I’ve even had pet kangaroos, guinea pigs, chickens, rabbits, birds, fish and mice! In many photos of me as a child, you will see me with an animal – feeding a lamb, walking with ducks, snuggling with my cat, and so on….. Things haven’t changed. I still love animals, especially the three fur babies at home – Mr Smiggles, Rembrandt, and Lucy. They are so much fun to have around, they make me laugh with their crazy antics, give me comfort when I’m sad, and keep me warm when I’m cold! I couldn’t imagine life without them! 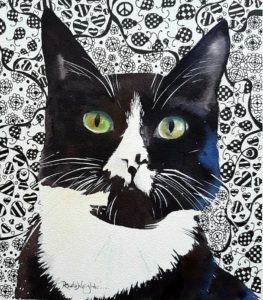 I also enjoy creating paintings of fur babies and all animals (and yes, that includes spiders), which is why many of my watercolour workshops include animals. Next month I will be holding a workshop titled “Painting Our Fur Babies”. In the workshop you will learn how to paint your pet (or your neighbour’s or family’s pet). 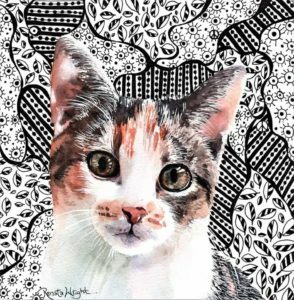 I will teach you how to draw your pet first – getting all the proportions right, then you will learn how to paint your pet – getting the colours right, capturing expression in the eyes, painting fur that doesn’t look overworked, and creating a background that makes them really stand out. You might even like to try some doodling background like the ones on this post! The workshop will be held in Clarkson (address to be advised) on Sunday 07 October, from 10 am to 3.30 pm. The cost is $105. BYO lunch and equipment (or pay an extra $20 to hire equipment). Morning tea is supplied. Contact me on 0450 524 229 or renatawrightart@yahoo.com.au to book in. Which fur baby will you paint? 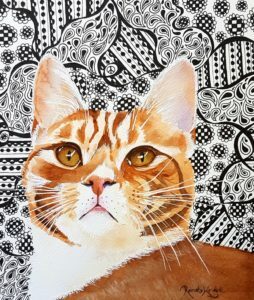 Love your pet portraits Renata what do you use for the background watercolour or ink brush or pen ?